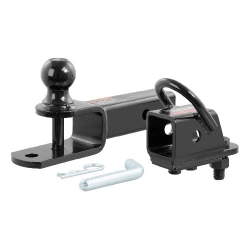 Ball mounts are a key product in the towing industry and a core item in any towing manufacturers product line. They have invested in the technology necessary to produce a full line of exceptionally strong and attractive ball mounts, ensuring that they are a step above the rest. The vast majority of ball mounts are CNC-formed and robotically welded for the utmost accuracy and cleanest weld lines possible. After construction, the ball mounts undergo a mechanical descaling process that creates a flawless surface for the application of our highly durable Aquence coating and powder coat finish. These two coats cure together to form a protective surface that is superior in rust, chip and UV protection. At Hitchweb Canada, we understand that there are countless lifestyles in the world of towing. Each person has a slightly different set of interests and needs. That is why we offer a wide range of ball mount options, not just in size and capacity but also in shape, function and capability. 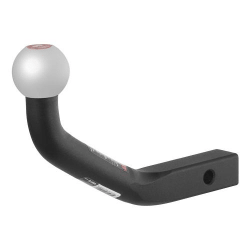 One of our most exciting ball mount products is our exclusive Euro ball mount. 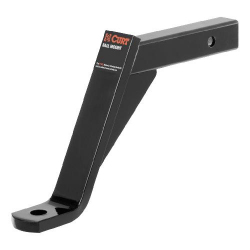 This sleek fixed-ball design is fast and easy to install, requiring no tools or torque specifications. 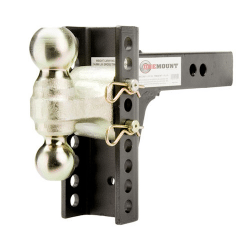 Each Euro Mount is designed to replace a common, old-style ball mount, making trailer ball installation unnecessary. 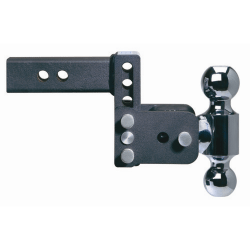 We also carry a number of other ball mount designs, each with its own set of advantages and uses. 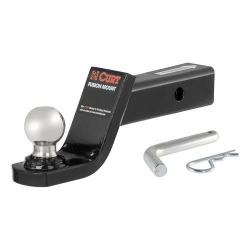 With weight capacity in mind and the amount of drop or rise determined, if you are towing a trailer you will need to choose a trailer ball and pin kit if required. 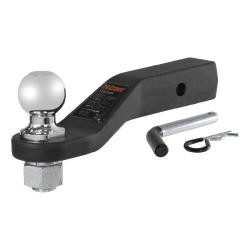 Many of our ball mount options come with a trailer ball already attached (such as our Euro Mounts, Loaded Ball Mounts and Fusion Ball Mounts), but some will require you to purchase the correct ball to complement your ball mount that meets your towing needs. Hitchweb offers countless trailer ball options, all of which can be viewed on our trailer ball page. Just remember, when selecting a ball, to choose one with a shank that will fit your ball mount. If a trailer ball shank is too small, we also carry a number of reducer bushings that can accommodate smaller trailer balls. What is Tongue Weight? How Do I Measure my Receiver?